This article is a step by step breakdown on how to add Tour Operators into the system. You would use Tour Operator for one main reason which is when you will give a commission to a third party agent. You would first need to enable the Tour Operator module first, to learn how to, click on this link here. Firstly, you would need to add a new User Role in the system before you can create a new tour operator. Navigate to Settings > User Management > User Roles as shown in the picture below highlighted in dark blue. To learn more about user roles, click on this link here. Here, click on the blue “Add Row” button highlighted in orange in the picture below. 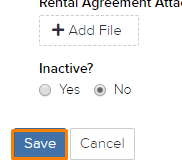 In this new row, type in Tour Operator in the blank label and select “Yes” under “Active?” as shown in the picture below highlighted in orange. Do note that the words you enter will have to be exactly as stated. Lastly, click on the blue “Save” button highlighted in orange in the picture below. Navigate to Settings > User Management > Access Control. If you have done the steps above correctly, you should see a new Tour Operator tab as shown in the picture below highlighted in orange. Firstly, navigate to Car Rental > Tour Operators as shown in the picture below highlighted in dark blue. Click on the blue “Add Tour Operator” button located on the top right of the page highlighted in orange in the picture below. Once you have clicked on the button, a new page will appear. Here, enter the details of the agent/tour operator that you will be adding to the system. Do note that the commission is set based on the percentage which will be from the rate of the vehicle, highlighted in orange in the picture below. Once you have finished entering the details of the agent/tour operator, click on the blue “Save” button located at the bottom of the page highlighted in orange in the picture below. One important thing to take note of is the Email Address. The Email Address is important as it will automatically create a tour operator account. Once you are done, click on the blue “Save” button as shown in the picture below highlighted in orange. Firstly, navigate to Car Rental > Tour Operators as shown in the picture below highlighted in dark blue. Next, click on the particular tour operator that you would like to delete. After that, click on the red “Delete” button located on the top right of the page as shown in the picture below highlighted in orange. To learn more about Tour Operator settings, click here.